The first of a planned 26 Inter7City engines made its inaugural trip between the two cities yesterday, for invited guests only, but will enter the service regularly from Monday. Scotrail says the trains form part of huge plans to create Scotland’s “best rail network ever” and slash travel times. But the organisation’s managing director, Alex Hynes, yesterday admitted that journeys between Aberdeen and Edinburgh will not be any faster between the launch on Monday and December – when timetables are revised. And in December, journey times will be reduced only by 10 minutes for at least a year, by which time the rest of the fleet is expected to be ready. Mr Hynes said he was not able to confirm exactly what the scale of the reduction in time would be at that point. He said: “There will be some small journey time reduction this December, we will lop off about 10 minutes between the two cities. “But we can’t deliver full journey time improvement until all the trains are introduced. “These are very powerful trains, they can reach 100mph far more quickly than our normal diesel trains and are capable of 125mph. “The entire upgraded fleet will be in by December next year with full journey time reduction. “We have some really ambitious targets but I can’t say at the moment exactly what that journey time reduction will be. Mr Hynes also revealed that a second Inter7City train is expected to be in service between Aberdeen and Edinburgh by December. The 17 five-carriage and nine four-carriage trains trains date back to the 1970s, but they have been given a massive £54million overhaul. They will ultimately offer better connections between Scotland’s seven cities, offering more direct connections from Inverness and Elgin to the Central Belt. 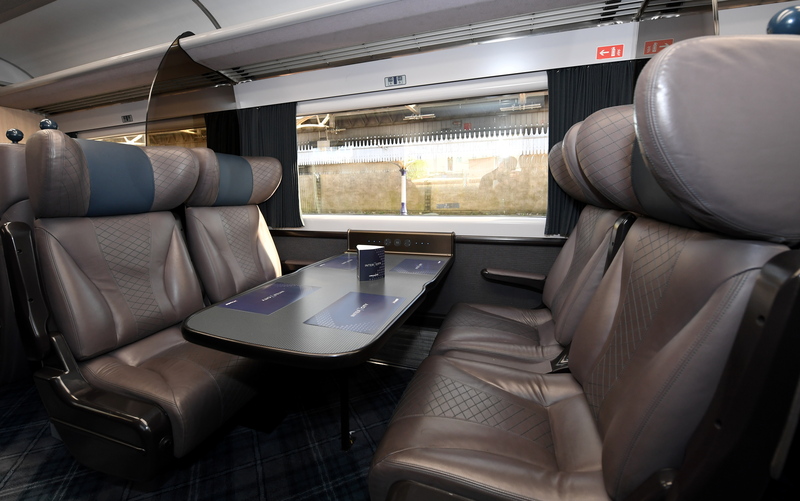 The carriages feature more seats, increased luggage space, power sockets at seats, more toilets and enhanced on-board hospitality with a cafe. Mr Hynes said it “felt fantastic” to board one of the five-carriage trains for its maiden voyage from Aberdeen to Edinburgh at 11.30am yesterday. He addressed guests over the speaker system by saying he had “waited a very long time” to welcome people to the train, which was originally slated to begin its travels in May. Mr Hynes later told the Press and Journal that the north-east formed a crucial part of Scotrail’s vision for the future. North East MSP Liam Kerr was one of the select few passengers on board. He said: “This should be a positive development for rail passengers in the north-east. “The new sets look great and felt spacious and comfortable. I think people will see a vast improvement from the current units. “However, the bottom line for regular users is that the trains have to run on time. 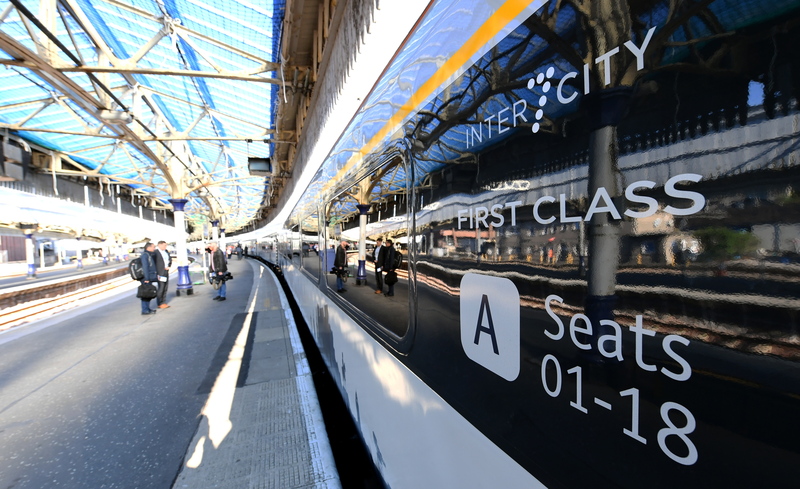 The revamped carriages which form the new Inter7City trains have been praised by disability campaigners for offering more priority seats than their traditional counterparts. There is just one section set aside on an entire train in most cases, but the new fleet offers space labelled as priority on every carriage. Charity leader Iain McWhirter said the move would make life easier for people – such as many with Motor Neurone Disease (MND) – who are in a wheelchair. The MND Scotland fundraising manager joined the trip yesterday as a way of highlighting the organisation’s work. He said: “We are charity partners with Scotrail, and we want to make the network more accessible for disabled people. Kris Baillie, a railway enthusiast who is partially sighted and suffers from Asperger’s syndrome, was also invited on the inaugural journey. He said: “When I first came on the train I was looking for what I thought would be the one disabled seat on board, at Coach B. A retired railway driver, who has gone on to become a charity champion, was reunited with an old friend when he stepped aboard the Inter7City train yesterday. Paul Breen began his career in the railway industry as a cleaner, but worked his way up to drive the 1970s trains which have been refitted and brought back to life as the new fleet. Mr Breen thought he would “never” get back into one of the trains after suffering a life-changing medical incident, but was invited as one of a select few to experience the inaugural journey yesterday. It was while driving a train in 2010 that the Aberdeen man suffered a brain aneurysm which left him in hospital for more than two years. The new Inter7City pulling out of Aberdeen station. After recovering enough to return home, Mr Breen dedicated himself to fundraising for Aberdeen Royal Infirmary’s roof garden – which was officially opened by The Queen last year. And he was awarded the British Empire Medal in recognition of his charity work in 2017. The Inter7City 125 Class 43 trains were introduced as Class 43 trains in the late 1970s, and were latterly operated on journeys between London and the south-west of England. “As a regular rail commuter, the trip between Aberdeen and Edinburgh – offering some stunning coastal views on a clear day – has long been one of my favourites. “But yesterday’s journey between the cities, on the first Inter7City train to take to the nation’s tracks and alongside about 100 other invited guests, was unusual for the sense of occasion that came with it. 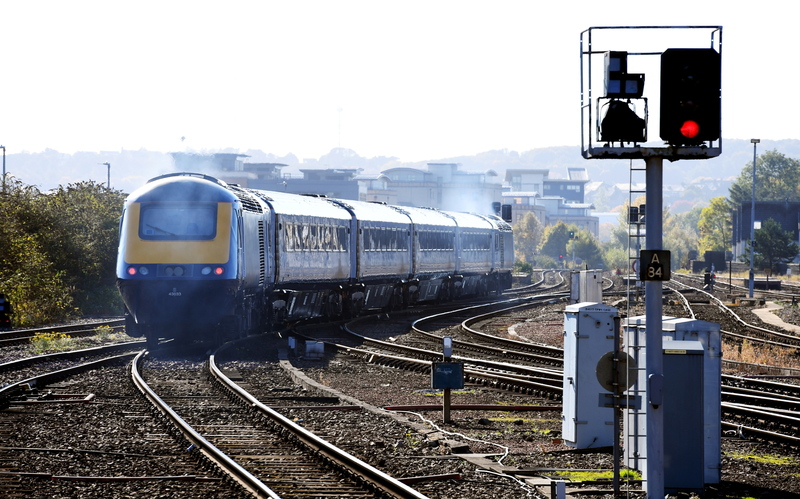 “There was a scrum of photographers filming the train from all manner of angles before it pulled away from Aberdeen. “And staff from Stirling Gin, a small company which has landed a big deal with Scotrail to provide spirits on the service, happily welcomed everyone aboard with a drink as the engine clanked into life. “A stroll through the five carriages uncovered veteran staff, ardent railway enthusiasts, Scotrail officials and even a documentary film crew who had all been invited along for the history-making journey. “Scotrail boss, Alex Hynes, told me he was convinced that customers who sample the new train will deliberately plot forthcoming journeys to the capital, or any of the other destinations en route, so that they can sit aboard it.